Family is undoubtedly something that matters a lot to many Ghanaian celebrities. Day in and day out, many of them inundate social media with pictures and videos of personal moments with their children. Here are 13 of the most adorable photos we’ve seen so far. The musician has said in interviews that although he had his daughters by mistake, they are the best things to have happened to him. Her name is Inaya Ayew. They are called Sir Bota Nsia Apau and Shanti Antwiwaa Nsia Apau. It's safe to say these kids are the source of Reggie's happiness. Samuel and his wife, Omega, named the children Samuel and Samuelina Inkoom. Asamoah Gyan has never ceased to express pride in his son. Afia has not kept her love for her sons a secret even for one day. She could not hide her joy when the twins secured admission to the Kumasi High School recently. 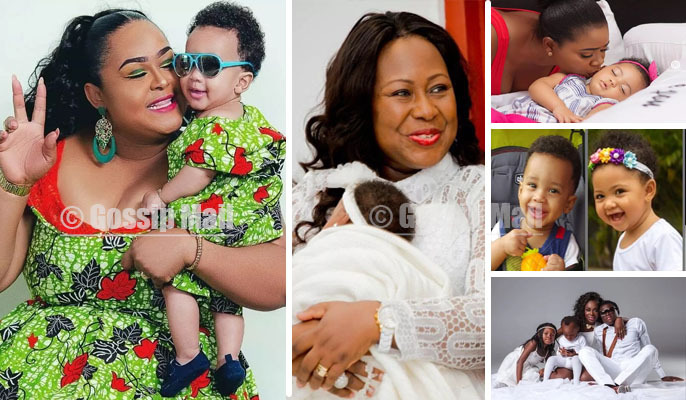 The former Ghana skipper is a caring father to his four children. The star actor is blessed with two sons and a daughter. Mzbel was ecstatic when her son secured admission to the Achimota Secondary School. Danku has not hidden her excitement for even a day since baby Lorde was born. His name is Alfie Nana Amponsah Okobeng. Gifty has described her baby, Nyame, as the sunshine of her life.